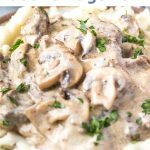 Instant Pot Beef Stroganoff is the perfect pressure cooker recipe, you’re going to LOVE it! 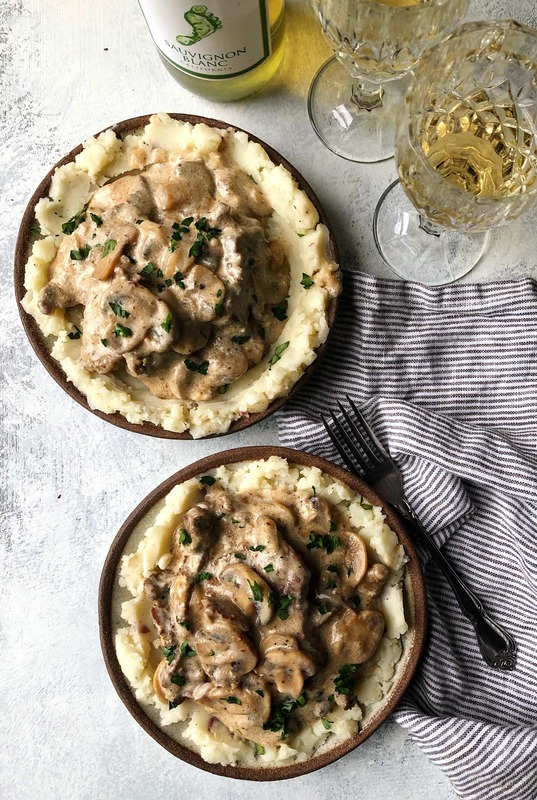 This is a traditional beef stroganoff recipe and there’s not a can of cream of mushroom soup in sight, it’s all from scratch. I’ve made this with strips of chuck roast instead of a more expensive quick cooking cut that’s typically used. 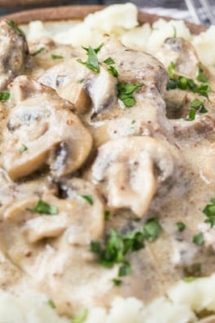 This ensures that the meat will cook to tender perfection under pressure so your Instant Pot Beef Stroganoff will be just right and not tough, chewy, or overcooked. You can serve this with noodles, or as I have over mashed potatoes, either works! Step 1 – I used a boneless chuck to make this recipe, so start by cutting it into strips against the grain. 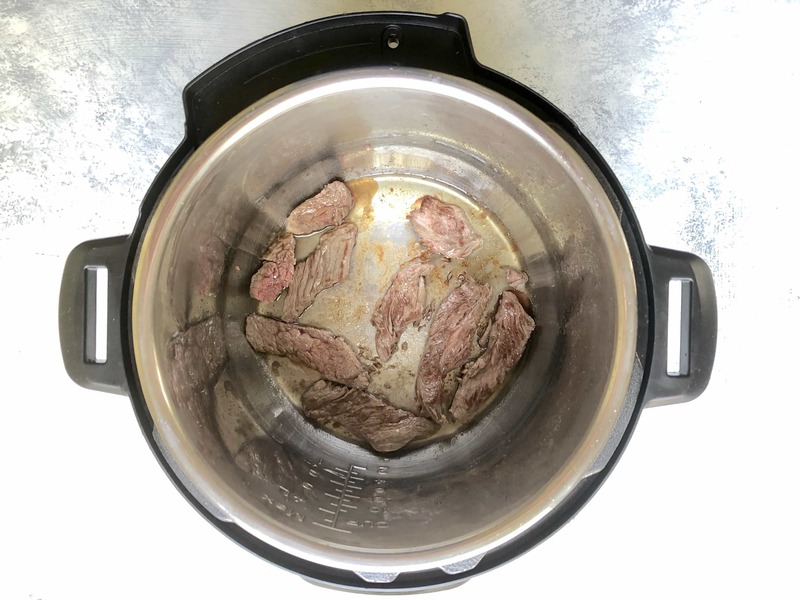 Step 3 – Turn on the saute setting in your pressure cooker and saute the beef in a little oil on both sides for a few minutes as you see in the photo below. You are not aiming to fully cook the meat at this stage, you just want a good sear on each side so cook it in batches so as not to overcrowd the pot. Step 4 – Once you’ve browned the meat remove it from the pot and set aside. Step 5 – Now add the finely chopped onions and saute them until a little golden in color like you see in the photo below. Take care not to burn them! Then turn off the saute setting. 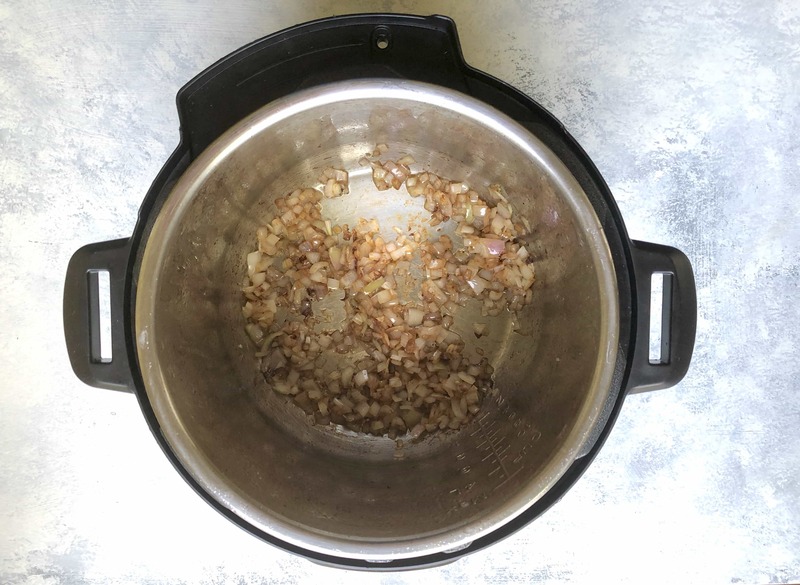 Step 6 – Next add back the browned chuck roast to your pressure cooker along with the onions and the gluten free beef broth, brandy, and bay leaf. Step 7 – Stir the pot well with a flat ended spatula to deglaze the lovely browned goodness from the onions and beef. Step 9 – When the cook time time is up allow the pressure to drop for 10 minutes then carefully release any remaining pressure by opening the valve and then open the lid. Step 10 – Turn back on the saute or browning setting in your pressure cooker and add the chopped mushrooms and mustard. You only need to simmer this for a few minutes until the mushrooms are just cooked and no more which will take about 5 minutes or so. 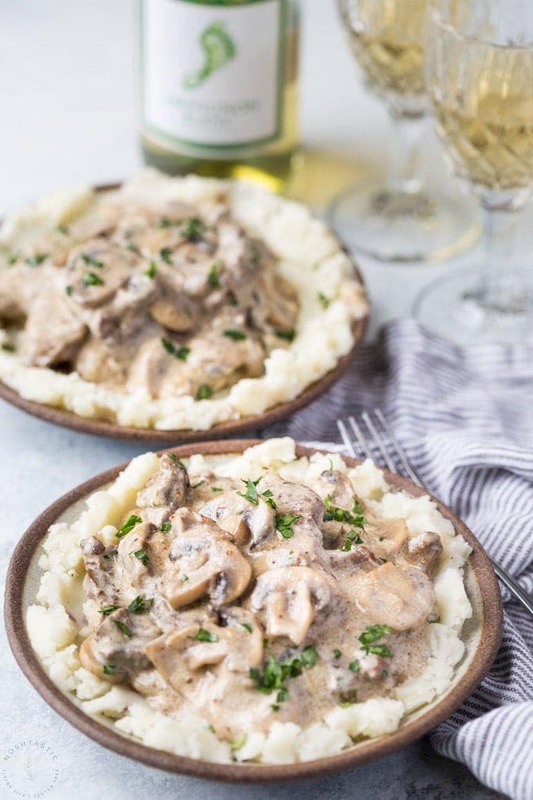 Step 11 – Once the mushrooms are fully cooked you can turn off the saute setting in your Pressure Cooker and add the sour cream and stir it well to warm through. Serve over pasta noodles or mashed potatoes. What’s the Best Cut of Meat for Instant Pot Beef Stroganoff? Typically beef stroganoff is made with a more expensive quick cooking cut of meat such as beef sirloin or fillet steak. 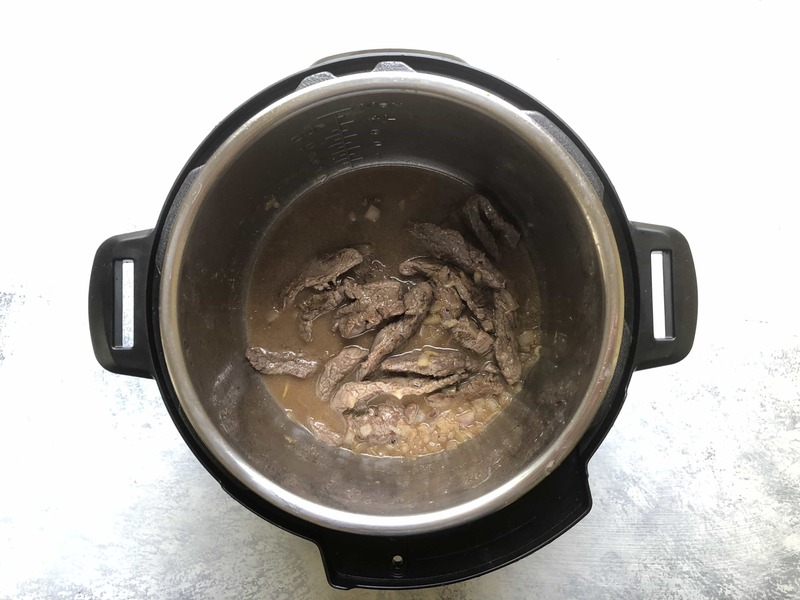 However, we are cooking this recipe in an Instant Pot Pressure Cooker so the quick cooking leaner cuts do not fare so well, we really need a beef cut that will be tender once cooked under pressure. This is the same cut that you use to make a pot roast, only we are cutting it into strips for this recipe. You could also use a brisket cut or some other piece of beef that is typically used for long slow cook times, which is confusing I know, as we are going to cook it quickly under pressure! But, this cut of beef must be able to withstand pressure cooking and come out nice and tender at the other end, the very lean cuts don’t tend to work as well for this purpose. Potato Masher – I served this over mashed potatoes so a good masher is a must! 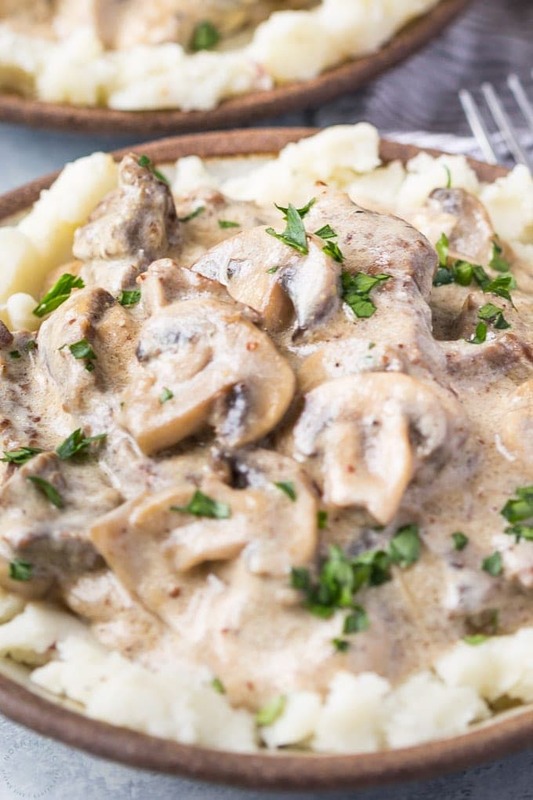 Instant Pot Beef Stroganoff recipe that's melt in your mouth tender! Cut the chuck roast into strips against the grain, then season with salt and pepper. Turn on the saute setting in your pressure cooker and saute the beef in a little olive oil for just a minute or two per side to get it brown, then remove beef and set aside. Add the onions and cook in the olive oil for about 5 minutes, then turn off the saute setting. Return the beef to the pot along with the beef broth, brandy, and bay leaf then using a flat ended spatula deglaze the bottom of the pot. When the cook time time is up allow the pressure to drop for 10 minutes (NPR) and then carefully release any remaining pressure by opening the steam valve and then open the lid. Turn on saute setting, add the sliced mushrooms and dijon mustard and cook for about 5 minutes more or until mushrooms are cooked the way you like them. Stir in sour cream and warm through. Garnish with chopped parsley and serve over mashed potatoes, mashed cauliflower for low carb, or gluten free noodles.